"Portal Canyon is the big brother of Cherry Canyon! While it contains a similar number of rappels, these rappels are more challenging, and there is the added difficulty of consistent down climbs between drops. These challenges combined with the surprising beauty of this canyon makes it awesome!" 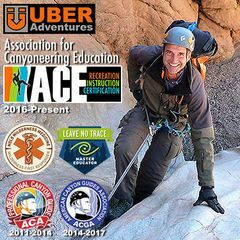 Priority will be given to recent graduates of the Uber Adventures Advanced Canyoneering Course (ACE-L2) in St George. 12-16 Rappels to 175'; steep approach; and the canyon requires a river crossing, so the descent is dependent on reasonable water levels for the crossing. REQUIRED PERSONAL GEAR: You MUST have a harness, helmet, gloves, a safety-tether with its own locking carabiner(s), a rappel device on its own locking carabiner, and a 48" footloop & Prusik on a locking carabiner, and at least 1 empty locking carabiner to attend this event. And, you might have to carry some group rope. Also, don't forget to bring plenty of water, sunscreen, snacks and clothing appropriate for the forecast! Find, Read & BRING the beta: Anyone who doesn't bring a copy of the beta with them might be turned away at the trailhead.